Spanish Constitution (Constitución Española) is the official constitution of Spain, which has been valid since 1978. With that constitution which came into effect after 1978 Spanish Constitution Referendum, Spain has changed its management system to democracy (Constitutional monarchy) instead of existing monarchy. The constitution was approved by General Courts (The Cortes Generales) on October 31, 1978 and Spanish citizens adopted the constitution with a referendum on December 6, 1978. I like this outfit on Queen Letizia, it's the second or the third time she wear it, but it's look very nice on her. I'll just prefer to see her hair in a different way, even if in some photos it looks very well. 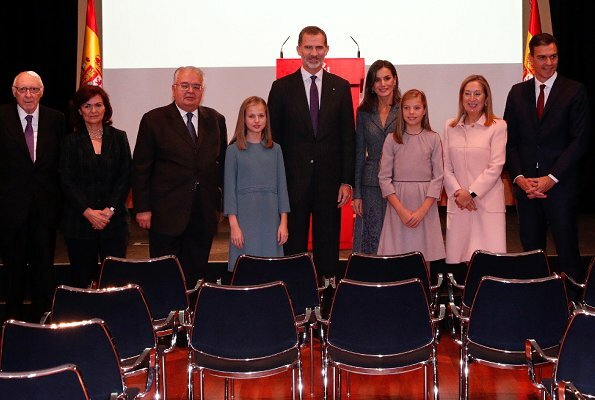 The girls are so lovely and the handsome King Felipe VI is, as always, very well. Happy Birthday Princess Leonor! The girls are getting prettier and prettier. Beth, I too noticed how she shines when she and the King interact in an official capacity. She just beams. It is good to see how both girls are being led into their royal duties cautiously so they're not overwhelmed with the weight of their responsibilities. I heard her little speech, and she is so very sweet. I don't comment on children's outfits, only because for better or worse those opinions are always directed at the mother, who ultimately has the last word on these instances. 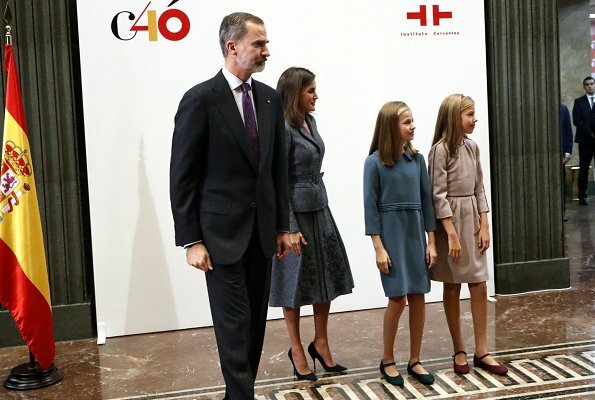 I am tired of reading (especially) in Spanish forums about how their outfits are so infantile, I for one applaud the queen for not hurrying them into become " fashion icons" on official events, there will be plenty of time... also on their private outings they look like most kids their age. 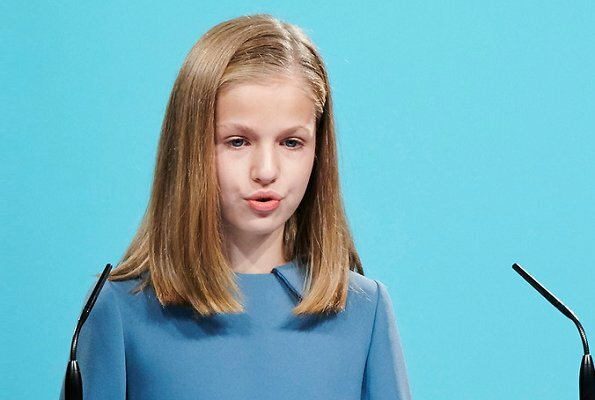 I recently read about princess Alexa and the filtered pictures from Instagram, and how the internet trolls are having a field day, and frankly she is too young for that kind of attention. 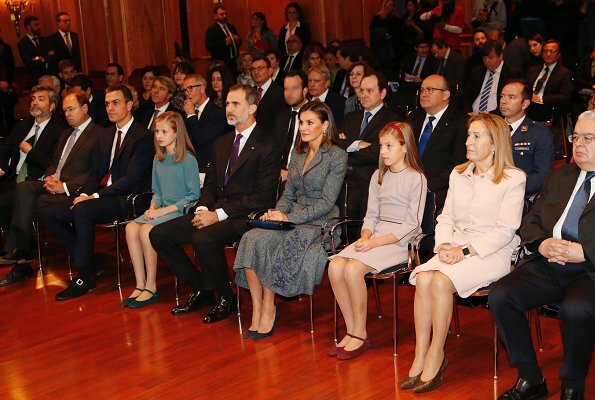 I never liked this Varela creation, too uniform like, with some flowers that seem incongruent, in my opinion Letizia made this choice very deliberately, in order not to attract excessive attention to her persona, and to give her daughter the protagonism on this very special day, Bravo!! Awesome and cute infantas,Leonor is so sweet!Sofia too! Sorry, Leonor is the Princess of Asturias, Sofía is the Infanta (not the Crown Princess). Infante (male) or infanta (female) are the King's children who are not the heir. The look and smile on her face as she looks up at her Dad is priceless. Pretty sure she got coaching from her Mom. Awesome!!. As far as one can tell from these pictures, the young girl did a good job - but is it not too much pressure for a girl of only thirteen...? Coralie, funny you should mention that, there is a sector of the " professional blog participants" that constantly complain about Leonor not having a bigger role, or having too few appearances, and they constantly blame the mother, and run wild with all kinds of conspiracy theories about this issue. I am of the opinion that this couple are very conscious parents, and will guide this child with exceptional care. Cherry Blossom, I absolutely agree with what you say about Letizia and Felipe as parents! Maybe I am a bit "over-protective", but this is just because I like Leonor and Sofia so much. Lovely Pss of Asturias. She looks very nice in the blue dress.Her first public speech, hope there is a video of it. Very lovely girls. Yes, you can easily find videos of her reading. P. Leonor looked so confident, calm and sweet that it was a pleasure listen her short reading. Proud parents Their Majesties. Both girls are beautiful. Queen Letizia has a delicate petite silhouet. That Varela creation is too heavy for her body type. The suit should be coordinate with a different shoes,according to the material type. I agree! The fabric is too heavy and the skirt overwhelms her. I guess Qun Letizia chose a discrete outfit intentionally to leave the spotlight on princess Leonor. Fantastic. I also admire the posture of the young girls. I like this outfit on the Queen and think she is slim enough to carry it off and still look elegant. The video of the Princess of the Asturias making her speech is fantastic. Her mother looks as if she would burst with pride. Cherry Blossom, I agree that the policy of keeping the girls in age appropriate clothes is to be commended. There was similar criticism of the outfits worn by Lady Louise, daughter of the earl and Countess of Wessex, at the same age. Both girls look great and I especially like the colour of Leonor's outfit. Wghat a lovely event. 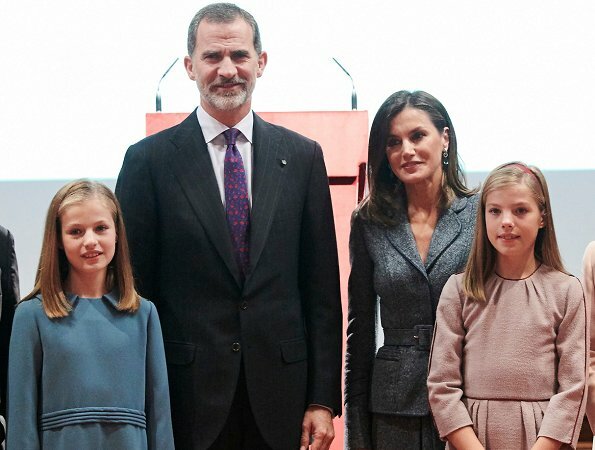 HOw the King and Leonor are beaming on each other on one pic - so nice to see! Both girls are really cute! This one hell of a well-dressed, classy and close family. The king and queen look appropriately regal. The princess and the infanta are appropriately dressed. 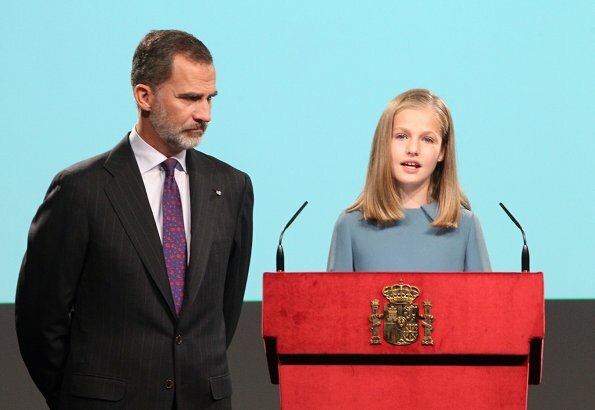 The Princess of Asturias gave a confident speech. Maravillosa familia, llena de amor y orgullo entre ellos. 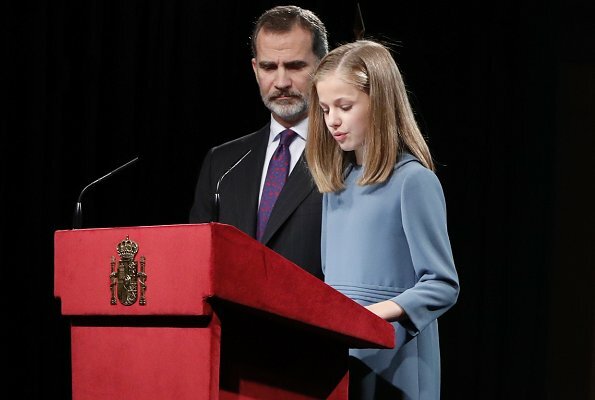 Un gran día para la Princesa Leonor, que hizo su pequeño discurso con voz segura, pausas dramáticas y levantando la vista al público. Mamá la ha entrenado bien. Todos se veían bellos y vestidos apropiadamente. Es un placer ver crecer a estas niñas preciosas, tranquilas y educadas. a very successfull performance for the little princess, congratulations to her and her family. Applaud Letizia for wearing this outfit four times now and agree with previous posts that she certainly did not overshadow her daughter's big moment. The girls look lovely and appropriate for this occasion. Letizia's belted jacket is chic and like the embroidery on the skirt, but wish the box pleated skirt were not so big and full looking and also wish her shoes were gray to match the fabric. Nice moment for this family. Happy Birthday to the Pss of Asturias. Nice dress her first public speech. Dad by her side for support. I don't know whybbut seeing Kinh Felipe with his daughter makes me cry...he is obviously proud of her....aw... To emotional! What a charming young girl. The clothes of these girls are entirely appropriate - even elegant for their age. I commend their parents for doing a great job in raising them. And I agree the interaction between the king and Leonore is so touching.